There are two different height standards for the Nigerian Dwarf goat. 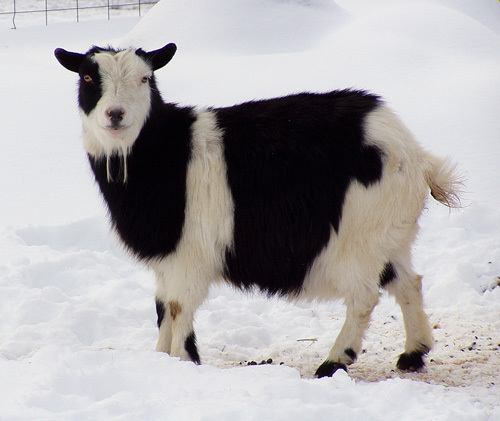 The height standard maintained by the American Goat Society and the American Dairy Goat Association requires does to be less than 22.5 inches (57 cm) at the withers, and bucks to be less than 23.5 inches (60 cm) at the withers. The Nigerian Dwarf Goat Association states does should ideally be 17–19 inches (43–48 cm) in height, with a maximum allowed height of 21 inches (53 cm), and bucks should ideally be 19–21 inches (48–53 cm), with a maximum allowed height of 23 inches (58 cm). Nigerian Dwarf Goats come in many colors: white, black, red, cream and patterns such as buckskin (brown with a black cape over the head and neck along with other black markings) and chamoisee (similar to an Oberhasli goat), with or without white spots. Some have white "frosting" on the ears. Although most are naturally horned, generally breeders disbud them at a young age (usually less than 2 weeks of age) for safety to the goat, its herd mates, and humans. Some Nigerian Dwarf goats have blue eyes, which is a dominant trait in goats. Nigerian Dwarfs give a surprising quantity of milk for their size. Their production ranges from one to 8 pounds of milk per day, with an average of 2.5. Since Nigerians breed year-round, it is easy to stagger freshenings (births) in a herd so the entire herd is never dry. Thus, they are ideal milk goats for most families. Their milk has a higher butterfat content than milk from full-sized dairy goats, averaging 6.5% according to the American Dairy Goat Association. Later in lactation, butterfat can go up to 10% or even higher. This makes Nigerian Dwarf goat milk excellent for cheese and soap making. Nigerian Dwarf goats are gentle and easily trainable. This, along with their small size and colorful appearance, makes them popular as pets. Some breeders bottle-feed kids, which makes them more bonded with humans. Others prefer to let their mothers raise them naturally, finding bottle-fed kids to be overly clingy. With either method, they can be very friendly and can easily be trained to walk on a leash and some enjoy coming into the house with their owners. Adult goats should not live in the house, however, because as ruminants, they need to spend a large part of the day eating hay, pasture, or browse, and not eating the couch!